A generation or two ago almost everyone had the opportunity to experience farm life either daily by living on a farm or spending time on Grandma and Grandpa's or Auntie and Uncle's farm during the summer. 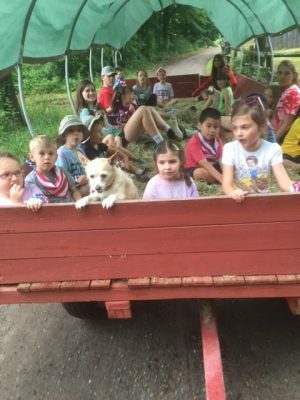 At Flamig Farm's Summer Camp Farm Adventure we offer kids a unique and rare experience that introduces them to what a farm is all about. We offer seven one-week sessions in June, July, and August for children age 5 through 14 from 9AM to 1PM Monday through Friday. Snack and lunch are provided. This year our "Farm Hands" group will be made up of 7-13 year olds and "Little Farmers" group, 5 & 6 years old. This will give both groups the freedom to play and learn at their own level. Our staff is truly remarkable. Many of them came to camp at age 5 and never left. 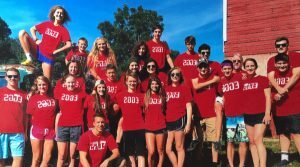 Over the years we have developed a fun and caring groups of counselors, all of whom love the Farm. All of us are committed to providing your child with an exceptional summertime experience. • Camp and Camp Activities are RAIN OR SHINE!! • Please dress your child accordingly!! (raincoats..rainboots.. sweatshirts). You may want to send a towel, bathing suit and water shoes on the day of your child's groups SPRING HIKE and of course on FRIDAY for the water fight. Is my child's health form on file? If your child attended our camp last year and your health form is current (they are good for 3 years after the date of the physical exam), IT IS YOUR RESPONSIBILITY to call our office and verify that we have a valid form on file for your child. If your health form has expired, IT IS YOUR RESPONSIBLITY to submit a new form signed by you and your doctor to our office no later than 14 days prior to the first day of the camp session. If you do not follow these instructions, your child will not be allowed to attend the first day of the camp session. NO EXCEPTIONS. Camp hours are from 9:00am – 1:00pm Monday through Friday. No campers accepted before 8:45am. Please wear comfortable close-toed shoes. NO SANDALS. Farm fashion–you will get dirty! On Spring hike days, water shoes are recommended. No cancellations due to weather! There are eggs to be gathered and animals to feed…rain or shine! Do you cater to specific dietary needs or allergies? Flamig Farm provides snack and lunch. If your child is not able to eat what is provided, you may send a bag lunch. Do you have a nurse on-site? Yes! She will gladly answer all questions and concerns pertaining to allergies, medications, etc. If medication is accompanying the child, please make sure the proper medication form, signed by the doctor, is completed and the medication is in its original box/container and is not expired. Please, please, PLEASE leave cell phones at home. They are easlily lost, broken or dropped in animal poop or water buckets. We have a farm phone for any camper who needs to use it. What if I need to switch weeks? Please refer to our changes/cancellation policies.